Look upon us, O God, Creator and ruler of all things, and, that we may feel the working of your mercy, grant that we may serve you with all our heart. Through our Lord Jesus Christ, your Son, who lives and reigns with you in the unity of the Holy Spirit, one God, for ever and ever. 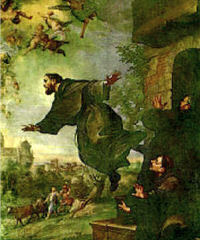 St. Joseph of Cupertino (1603-1663) was born at Cupertino, Italy, and died in Osimo. He was of lowly origin and had little formal education. In his youth he was employed as an apprentice to a shoemaker. He joined the Conventual Franciscans as a lay brother but was later ordained a priest. He was noted for his great austerities, his angelic purity, his great devotion to Our Lady and especially for his ardent love of God. According to the 1962 Missal of St. John XXIII the Extraordinary Form of the Roman Rite, today is his feast. Joseph of Cupertino was such an extraordinary saint that his fellow-Christians could scarcely cope with him. First of all he was forgetful, even as a child, often not turning up for the scanty meals his impoverished widowed mother prepared. He would wander about the village of Cupertino, Italy, where he was born, gazing open-mouthed at everything. He found it hard to learn. And he was clumsy. When he was seventeen he decided he wanted to become a monk or friar. The Franciscans would not take him because, they said, he was too stupid. The Capuchins threw him out after eight months because he broke everything. Eventually a Franciscan house at La Grotella accepted him as a stableboy. He prayed and fasted and did his best to perform every task to perfection. Eventually the delighted brothers decided to accept him as one of their equals, and in 1628 he was ordained priest. From that time onwards Joseph of Cupertino was continually passing into ecstatic trances, sometimes even appearing to float above the ground. No meals could be taken in the monastery without some extraordinary interruption because of Joseph's miraculous behaviour. For thirty-five years the community decided that he should be kept out of the choir and refectory. Naturally enough his miracles and above all the reports of his supernatural levitations attracted countless curious visitors. In 1653 the church authorities transferred him to a Capuchin friary in the hills of Pietarossa and kept him completely out of sight. Finally Saint Joseph was allowed to join his own order at a place called Osima, but he was still kept out of sight until his death in 1663. All this he bore without the remotest complaint. Fittingly the twentieth century has made the saint patron of pilots and airline passengers. Patron: air travellers; astronauts; aviators; paratroopers; pilots; students; test takers. Very few saints have recorded that they levitated during prayer. See if you can find some other saints that have also levitated. Read more about St. Joseph of Cupertino. St. Joseph suffered severely at the hands of his own ecclesiastical superiors. It is a bitter thing to find no aid or comfort among one's own brethren, and, moreover, to be misunderstood and condemned by them. Even this, however, is permitted by God; and it may serve for the cleansing and perfecting of the soul, as shown in the life of St. Joseph. Pray for the grace to endure misunderstanding and rejection.